HÀ NỘI — There remains massive untapped potential for bilateral co-operation between Vietnamese and Taiwanese firms in the sectors of automotive parts, green energy and e-commerce, said Chening Fan, director of the Taiwan External Trade Development Council (TAITRA) - a Taiwanese nonprofit trade promoting organisation. The director made the remarks to the press on the sideline of a business matching conference held yesterday in Hà Nội. The event witnessed the participation of approximately 138 enterprises, 100 of which were Taiwanese. Việt Nam has experienced high economic growth rates in recent years and is a lucrative market for Taiwanese products, he said. Alongside this, Việt Nam has signed many free trade agreements (FTAs) with various countries and blocs. This has resulted in tax incentives that Việt Nam could benefit from when exporting goods to many large markets. As a result, Taiwanese enterprises hope to foster their co-operation with Vietnamese partners in developing products which could then be shipped to these markets, the director said. 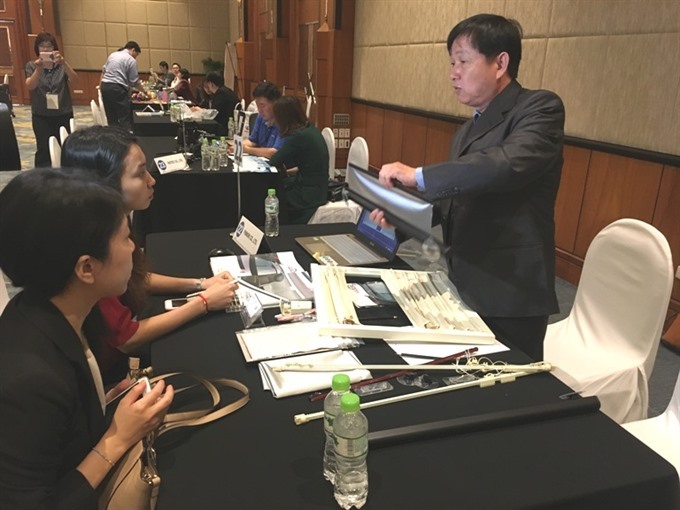 Sales Director of Long Tsuen Industrial Co Howard Ko, which manufactures and exports valves and pipe fittings, boiler parts, and water, gas and steam accessories, said his company seeks to expand its partnership to more Vietnamese businesses to increase its distribution to further tap into the market. Long Tsuen Industrial Co exports US$100,000 worth of products to the Vietnamese market annually. This is a modest figure compared to the potential that the market holds, he said, addding that the industry and construction sectors in Việt Nam have grown rapidly over the past few years, resulting in high demand for his company’s products. During the business forum, firms from Việt Nam and Taiwan also discussed co-operation opportunities in many other areas such as home appliance, farm produce, cosmetics and sports equipment. A representative of a Vietnamese company specialising in producing and processing cinnamon-made tea products said during the event that his company hopes to advertise its products and seek new trade partners from Taiwan because of similarities in tea culture between the two economies. Bilateral relations between Việt Nam and Taiwan in trade and investment have been improving over past years. Bilateral trade reached $12 billion in 2016 and over $12.4 billion in the first 11 months of 2017. Việt Nam exported nearly $2.88 billion worth of goods to Taiwan during this period, up 16 per cent year on year while its imports from the market hit close to $9.55 billion, up 9.4 per cent year on year. This means that Việt Nam saw a trade deficit of more than $6.7 billion with Taiwan, 7 per cent more than the same period of 2016. Among Việt Nam’s major exports to Taiwan are live animals and animal products, vegetable, processed food, and beverages, as well as minerals, crude oil, chemicals, rubber goods, and textiles and garments. Its imports from Taiwan consisted mainly of seafood, plastic materials, wooden goods, chemicals, paper and paper pulp, electronics components, machinery and transport vehicles.